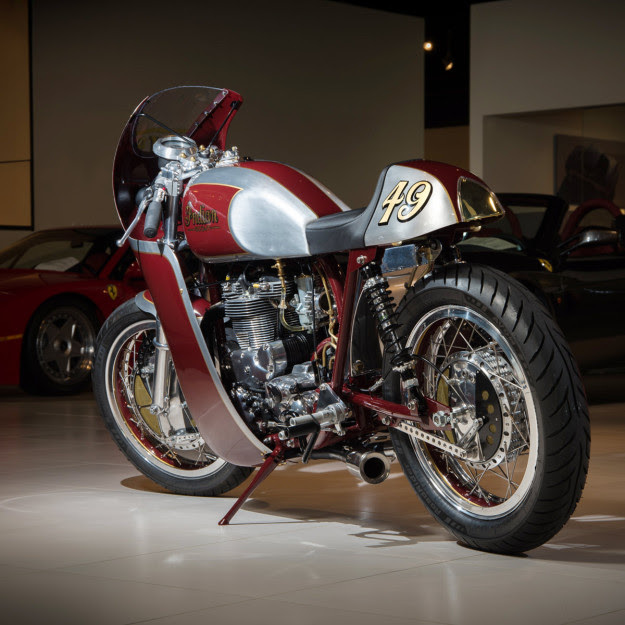 Steve McQueen owned an extraordinary array of vehicles including a 1931 Pitcairn PA-8 biplane, a Ferrari 250 GT Lusso, a Jaguar XKSS, a Ford GT40 and a number of motorcycles – including the 1934 Indian Sport Scout you see here. 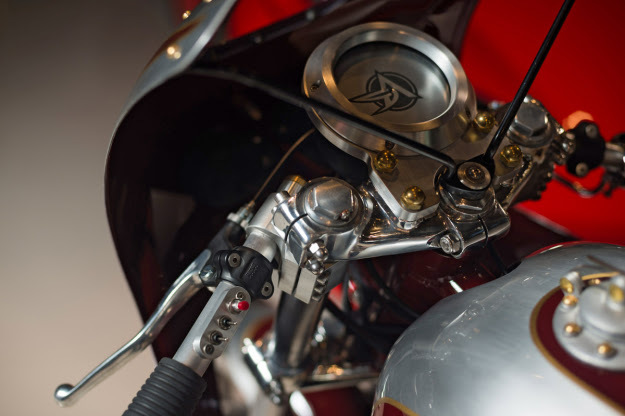 Although he’s perhaps more famous for his association with Triumph and Husqvarna, McQueen’s love of American motorcycles was never in doubt. His first bike was a Harley-Davidson that was so oily and smoky that it cost him the affection of the girl he had been dating, he also owned a number of Indians including an old custom chopper, a Chief and of course, a Sport Scout. 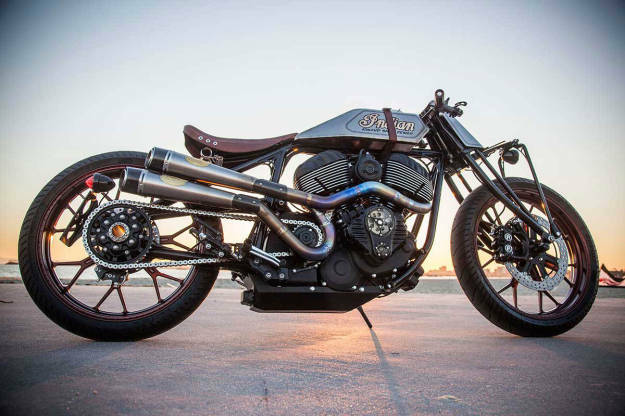 In some respects, the Indian Sport Scout was a return to the roots of the Scout model line. The first two generations of the model had been very popular and favoured for their ability on race tracks, at hill climbs and in endurance events. 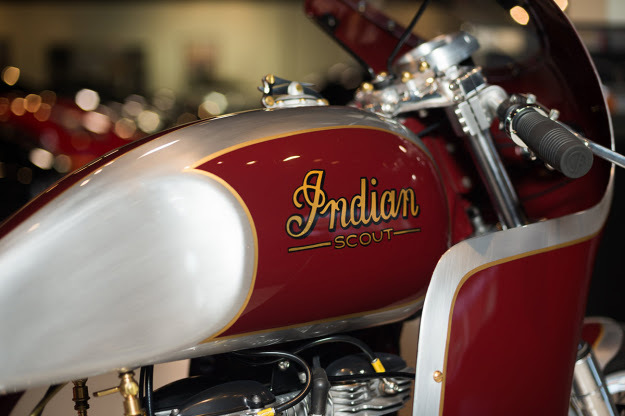 In 1932 Indian introduced the third generation Scout, it had been developed with cost cutting in mind – and as is often the case when the bean counters get involved, it resulted in a lot of disappointment. The plan was to develop a single frame design and then use it as the base of the Scout, the Chief, and the Four. The issue was that the frame was heavy and cumbersome. This was a major drawback for a nimble, sporting motorcycle like the Scout. The public reaction to the new Scout was almost entirely unfavourable and Indian set about trying to rectify the situation as quickly as possible. Two years later they released the new Sport Scout, it had a lighter frame, girder forks, improved carburation and alloy cylinder heads – it addressed the concerns that the pubic had raised with the third generation model and it returned the Scout to its winning ways on the race tracks of North America. 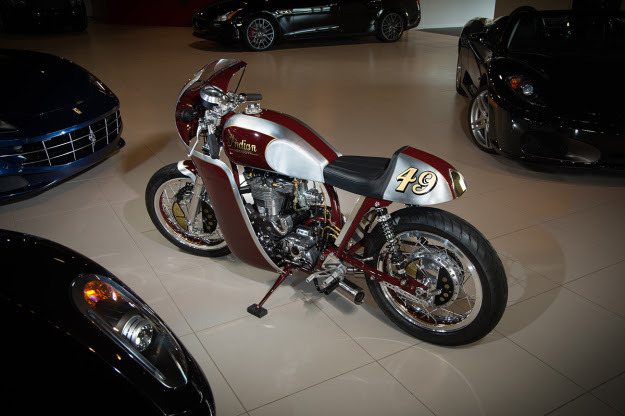 A modified Indian Sport Scout would go on to win the first Daytona 200 in 1937, as well as hundreds of less famous races across the continent. The history of the 1934 Sport Scout wouldn’t have been lost on McQueen, he was an avid motorcycle racer who funded his early acting career by winning local races and living on the prize purses. 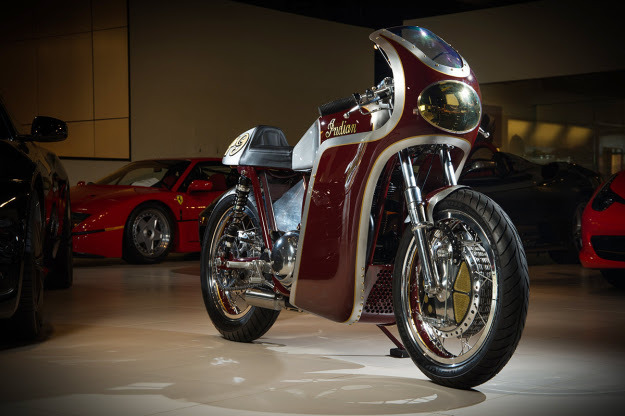 This Indian was sold from his collection in 2006 to a buyer in London who rode it sparingly and displayed it in his office. It’s now being offered for sale with an estimated value of between £55,000 and £65,000, if you’d like to read more or register to bid you can click here. The Indian Chieftain is a big motorcycle, designed to soak up the miles on the smooth highways of ‘Murica. The star of the show is the new Thunder Stroke engine, a mighty 111 cubic inch (1811cc) monster pumping out 119 ft-lbs of torque. 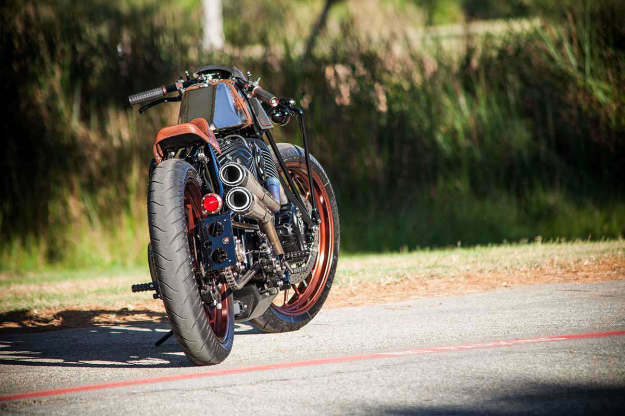 It’s a remarkably good-looking motor, and it caught the eye of Roland Sands, the man who can do no wrong when it comes to creating genre-bending customs. 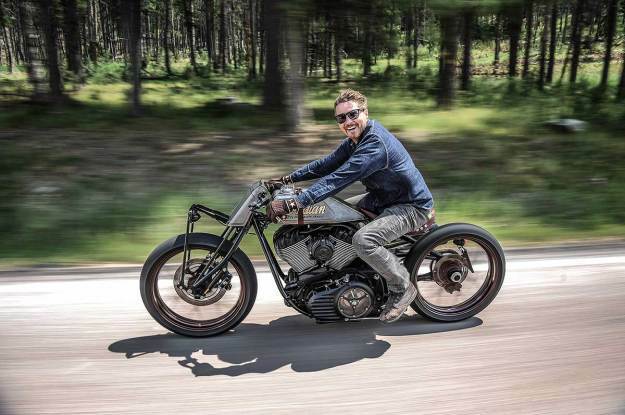 Sands has now tapped into Indian’s rich motorsport heritage, and slotted the Thunder Stroke into a vintage-style, boardtracker-inspired build: the Indian Track Chief. That single-side rigid frame is a masterpiece, hugging the engine just-so. It’s hand-fabricated from 4130 chromoly steel, finished in black by Olympic Powdercoating. 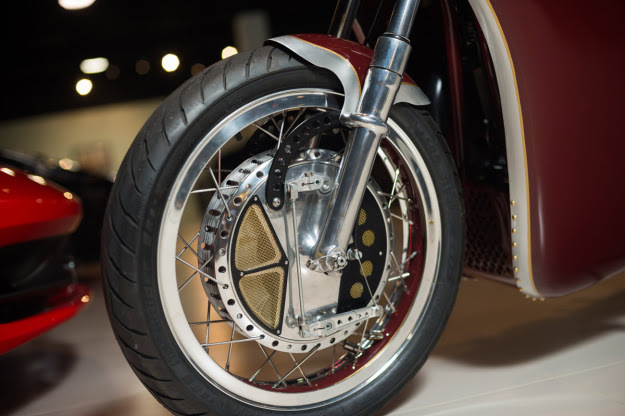 The frame is a perfect match for the black Paughco Leaf Spring Fork assembly, a fascinating contraption designed for customizers who want a vintage look with high-quality, modern construction. Tucked down low on the left side of the fork, near the axle, is a Fox DHX mountain bike shock—a component popular with riders on the World Cup downhill series. Sitting above the frame is a hand-fabricated titanium tank; hidden below the frame is an aluminum belly pan. 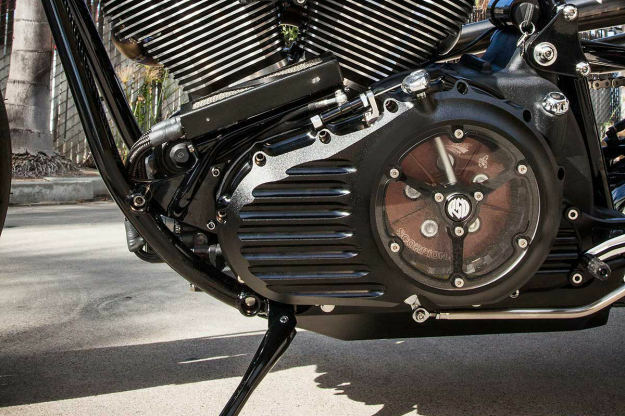 The internals of the Indian Chieftain engine are stock, but there’s a Roland Sands Design Blunt air cleaner, a high-flow, low-profile fitment that doesn’t get in the way of your leg. There’s a see-through RSD Clarity cam cover and a matching outer primary cover too—revealing a custom clutch pressure plate from Barnett. 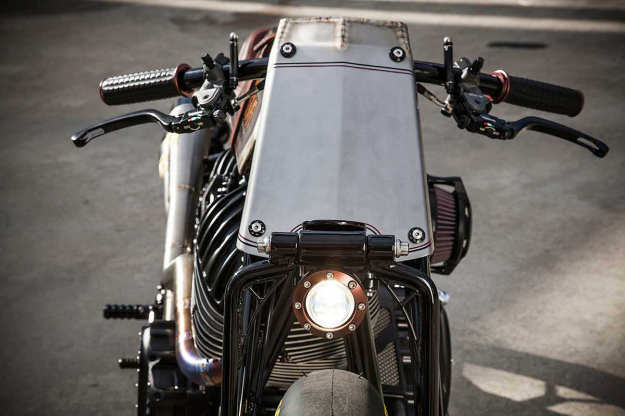 “We told Barnett we were making a one-off primary cover and wanted some high-end billet clutch internals to show off. These are not production parts for either of us, but may be down the road,” says Brewer. 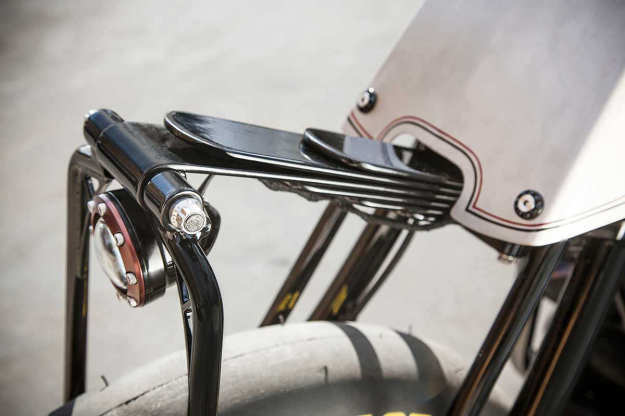 The handlebars are welded to the upper triple: allowing Sands to make very narrow bars, and eliminating the use of risers. 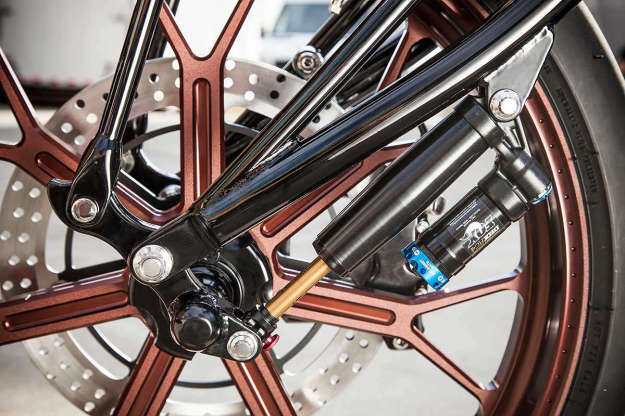 (“They are basically clip-ons—without relying on a pinch bolt.”) RSD Traction Grips with a custom bronze anodized finish add to the vintage look. As we all know, wheels are critical to the boardtracker look. And here we’ve got 21” x 3.5” lightweight RSD Del Mar rims—with the same bronze finish as the grips. They’re shod with Dunlop Elite 3 tires, which are conveniently available in a 120/70-21 size for custom builds. Stopping power comes from Performance Machine calipers and Brembo cylinders, and the rear sprocket and drive unit come from Gregg’s Customs. Paint is low-key: a classic Indian red and black combo, applied by Hot Dog Pinstriping, with gold leaf for the oversized logo on the raw metal tank. 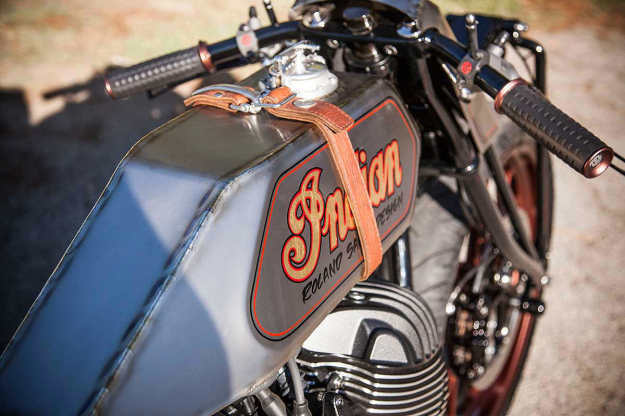 It’s not the kind of machine that will find its way back into Indian’s catalog any time soon. But the burgeoning cool factor of America’s oldest motorcycle brand just stepped up a notch—or three. Image below courtesy of Barry Hathaway. With all eyes on Indian Motorcycle’s relaunch of the iconic Scout, it’s refreshing to see vintage examples vying for attention too. And this eye-catching 1949 Scout from Analog Motorcycles should have no trouble stealing a little limelight. It took some shoehorning, but Frame Masters managed to squeeze in the Scout’s engine and transmission. Analog then installed a set of vintage Betor forks, matched to modern Gazi shocks, and a new wheel set: TZ750 hubs laced to 18” aluminum rims. During the rebuild the engine was punched out to 500cc with a hand-cut billet cylinder. 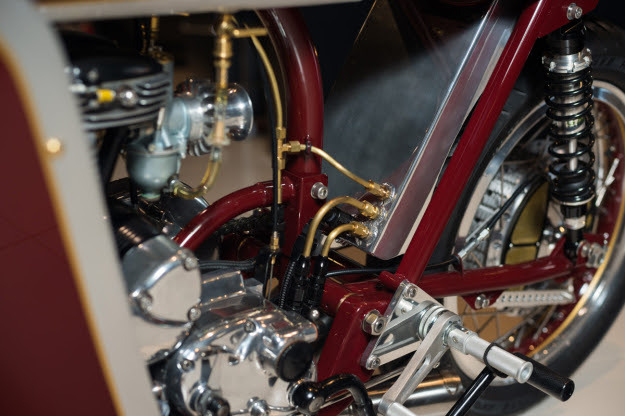 The electrical system was converted to 12-volt with an electronic ignition, and the oil cooling system was redesigned and hooked up to a new oil tank. Next up was the Scout’s bodywork. Tony shaped bucks of the tank and tail sections out of Styrofoam, and sent them off Pavletic Metal Shaping to hand-build aluminum versions. Pavletic also handled the aluminum fairing—based on a wire frame template that Tony mocked up. Turning to the finer details, Analog fabricated a new exhaust system, terminating in Cone Engineering Stubby mufflers. Tony also fitted Tarozzi rear-sets, with levers that fold out of the way of the kickstart. (Tony lists the redesigned kickstart lever as one of the trickiest parts of the entire project). All the plumbing was replaced by brass lines and braided stainless tubing. The speedo is a one-off from Seattle Speedometer, and Free Form Designs handled the speedo bracket, rear sprocket and oil manifold. Much consideration went into the final finishes: “The plan was to do raw aluminum, but after seeing a lot of motorcycles coming out in recent months with the same look, I opted to give it more color.” Analog “Scotch-Brited” all of the aluminum bodywork before clear-coating it. Regular Analog collaborators were called in: Kiel of Crown Auto Body for paint, Brando for pin striping and gold leaf, and Art Rodriguez of Rods Designs for the seat’s leatherwork. And so you should be, Tony. Now please get cracking on that Kawasaki W1. Photography by Whiplash Racing Media. To see more of Tony Prust’s work, visit the Analog Motorcycles website. Engine has hand-cut billet cyclinder, 12 volt conversion and Dyna III electronic ignition. 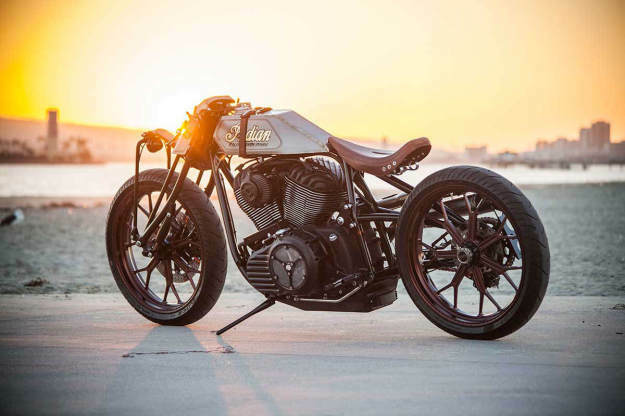 The post Indian Scout by Analog Motorcycles appeared first on Bike EXIF. When Clayton Schaefer from Street Spirit Cycles received a phone call from a customer asking whether he would “café my Indian?” his first thought was “there’s no way, it would be a sacrilege!”. He just couldn’t imagine taking the sawzall to a piece of motorcycle history. “But as we went back and forth I learned that we weren’t just talking about any Indian”, says Clayton. ”We were talking about the Indian that bankrupted the company: the slow, awkward, 213cc cousin of the beloved big twins”. You see, the Arrow 149 was one of the last bikes to roll out of the original Indian factory floor before they went out of business. It seems the development costs and teething problems of this little motorcycle may have actually been the final nail in the coffin. So with that in mind Clayton took on the job – but decided to leave the sawzall alone. “The actual rearsets consist of a mix of handmade parts and pieces scavenged from other builds, like the shifter linkage ball joints from a GS450 and the passenger peg mounts from a Ninja 250. “Side covers have been resealed, which improved the oil leak situation considerably, but I’m pretty sure these bikes leaked oil when they were brand new so there’s only so much you can do.